Sweet a blog! Anyway, I would like to know people’s thoughts about having 4 DMs running a sandbox, which is where I think we diverge from other Sandbox campaigns which I have seen on the net. I think that there are advantages and disadvantages to this approach. It allows for more games, and prevents DM burnout, and allows for more DM-style variety. However, I think that the multiple DM approach hasn’t been very good for immersion, as it is hard to keep track of all the changes in the game world (as a DM and a player), so mostly what people are keeping track of is whether their character is alive. I think the best solution is to find ways to make multiple DM’s work better rather than restrict to one DM, as this better allows for the holy grail of geeks everywhere, which is the once weekly, and occasionaly (when the wife is ok with it) twice weekly D&D game. 1: Henchmen get a half share of gold (but characters still get the xp for that gold). 2: Switch to the Labyrinth Lord price list where plate mail is hundreds of gp, or make a new one with better prices and put it on the wiki. 3: Enforce encumbrace rules. Make them buy mules, carts, wagons, and dudes to mind and pull them. I personally think mule trains and caravan crews are the “mini strongholds” of low level D&D. Yes, please! 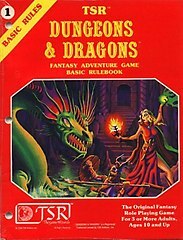 I am thinking of a co-DM sandbox, using Red Box D&D. If you have questions, put them in the comments here or on the forum and we’ll do our best to answer them. Thanks for checking out our blog. Absolutely awesome. I’m going to go by this list every time I make more house rules, and every time I’m stick in regards to game prep. Thanks, N. Wright, I’m glad my stumbling to victory is helpful.